We are a small rattery based in Rockhampton, Central Queensland, Australia. 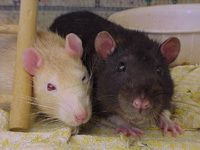 Because rats aren't as popular here as in the larger cities, we are restricted to breeding only a few litters per year. With fewer babies, we can spend more time handling them so that when they leave for their new homes, they are friendly and loving pets. If we cannot find homes for them, we keep the babies ourselves. We breed for health and temperament first, colours and markings second. We do not cull or put babies in pet stores that may sell them as snake food; in fact we are very suspicious of all pet stores in general after being lied to by one store owner about where our babies would go. After assuring us that they wouldn't be sold as snake food, a friend called them up anonymously and asked if they had any rats for his snake.. and they said not at the moment, but they would be getting some very soon (ie, OUR babies). We won't EVER be going there again. At the moment our crew is made up of various colours: silvered black, mink, champagne, silver fawn, argente (lynx), agouti, blue agouti, cinnamon and pink-eyed-white. Markings include selfs, berkshire, cardigan, irish, hooded, downunder hooded/spotted and downunder berkshire. These pages are to show other rat lovers how we care for, house, feed and play with our ratties. If you have any questions, comments or suggestions, please email us. If you are from the Central Queensland area, it would be great to hear from you! It is our hope that one day rats will be popular enough in the Central Queensland area for us to begin holding shows.